I want to say a great big THANK YOU to all of the people who have sent emails requesting specific ideas for upcoming events! While I’m not able to do pictorials on each and every one, I hope the emails and photos I’m able to send to you are of help. Keep ’em comin’! Right now is a great time since our personal social calendar has slowed a bit! Meanwhile, I have created a very special idea table for a very special occasion. In honor of the blushing bride, her maid-of-honor requested ideas for a do-it-yourself table that could easily work with the existing dinnerware and other set-up items provided by the venue. To get an idea of what that could look like, I set up a tablescape depicting an easy DIY pink and white wedding shower/luncheon. A huge shout out to Cindy King at The Stanley Historic Event Space in downtown Lee’s Summit, Mo., for allowing us to come in and use her beautiful space for our demo table. Like The Stanley, many venues have soaring ceilings. Unlike The Stanley, however, not all venues’ ceilings look the greatest. To “fill up the dead space” without overwhelming the table, try using a tall, airy centerpiece as demonstrated in these 20″H white glass vases. So as not to deliberately draw attention to the unattractive ceiling, though, do not exceed half the height to the ceiling for your centerpiece. The idea is to psychologically cut the eye’s interest off at the top of the arrangement. Using branches like fresh curly willow, which is both popular and easily obtained, keeps the look light and see-through. (Another example of this is seen here.) This is also a good place to add touches of the prevailing color. Again, a few branches with blooms dispersed amongst the curly willow will easily and inexpensively achieve that goal. You’ll also want to bring color closer to the table which can be achieved by using smaller vases of the same color with compact bouquets. In this instance, we used pink sweetheart roses. 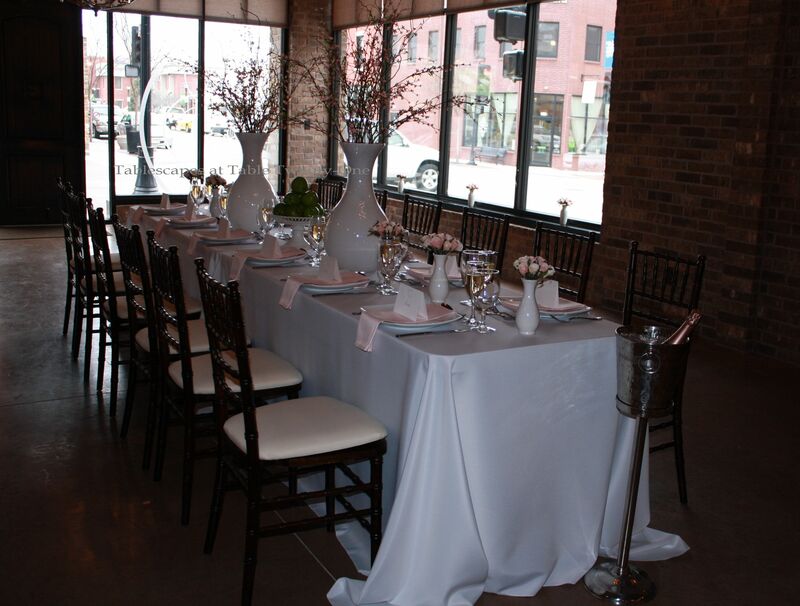 If your venue has windows, carry the flavor of the table to those windows with additional bouquets. Depending on the look you want, use either short and compact bouquets as shown above to achieve this more demure look or, for a more dramatic feel, taller arrangements that have the same wispiness as the tall ones on the table. 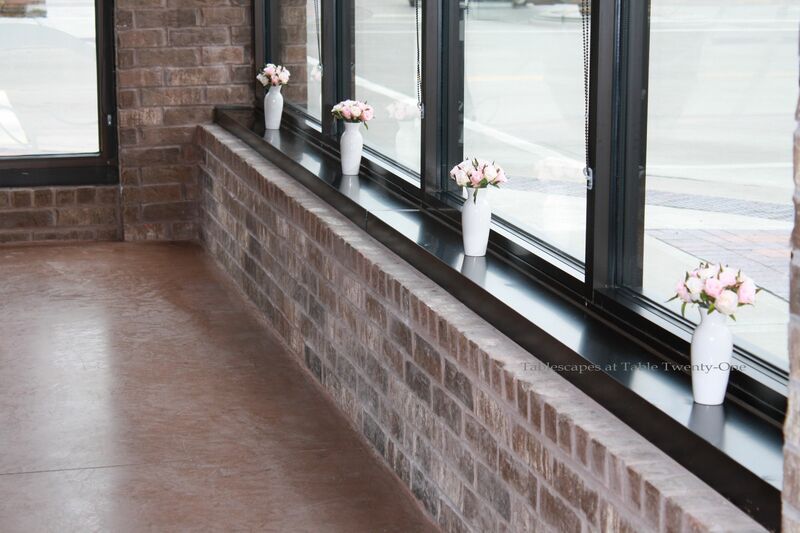 Displaying arrangements in the windows gives guests a little hint of what’s to come as they approach the building. Just be careful not to totally obscure the view. That’s part of the charm and attraction of a room with a view! For a clean, classic look, it’s all about repetition. With this particular look, everything must be lined up perfectly so that photos present the table in its best light. See here about measuring. Most venues provide as a part of their package either round or oblong dining tables with basic white, black or ivory linens. Not all venues provide floor length as a standard, but can provide them with an upcharge. White plates – usually round, but sometimes square in these modern times – are also a staple, as is plain flatware. To make the most of it, work with the colors provided by adding lots of a complementary color of your choice. Here, pink is the bride’s signature color. It is repeated in the florals, the napkins (for which a nominal upcharge of about $1.50 would likely be applied), and the menus for maximum punch. The napkin fold here is kept simple, across the plate and uniformly dropping over the side. Although this fold is simple, a ladies’ luncheon is the perfect time to experiment with fun or lavish styles. Standard clear glass stemware is also a staple at most venues. Not to despair…as long as it has a classic shape, it will have plenty of appeal! The oblong table used by most venues are only 30″ wide, so space is at a premium. To make the most of the available real estate, try combining your menu and place card as seen above and place it on the plate. DIYers can create something on your home computer or use pre-made note cards. 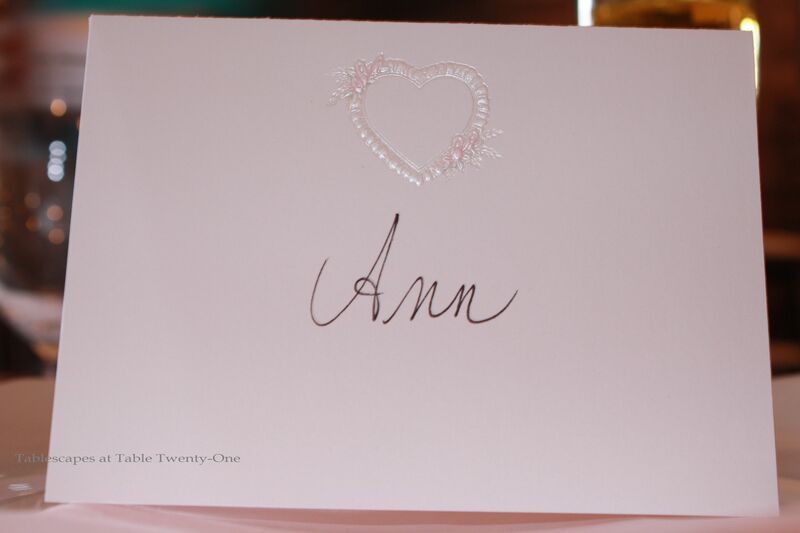 The pink floral theme is continued on the front of this card in the shape of a heart. To avoid monotony, add an unexpected but coordinating color in either tiny bits or in one big wallop. Here, a cake plate stacked high with bright green Granny Smith apples in the dead center of the table does the trick. Decorating with fruit is an easy and cost effective way to add color, texture and contrasting shapes to your tablescape. Hi Alycia! So elegant, simple & modern! Love your small vases of roses & larger arrangments as well as your stacked apples. I always enjoy fruit & flowers together on a table. I love your tablecloth length, sweeping the floor like a wedding dress! Ooooh, Mary….I like that analogy: “…sweeping the floor like a wedding dress.” Very nice description! You GO, girl! Thank you so much for popping in to take a look! Absolutely lovely! So elegant and feminine. Also, I love the little pop of green the apples provide. Like everything you do, so well done! This one is super cute! …and springy!! And EASY to duplicate! So smart. Thanks, Kelly! Are you implying “EASY to duplicate” in that I could whip it up with a little something extra for ReEvent? 🙂 I actually told another blogger about the ReEvent coming up in April. I hope lots of people saw your post yesterday on my FB page with that beautiful floral arrangement using plumbing parts! That was the coolest!!! Lovely! Simple and elegant! Another winner. Thanks again for taking part in my blog crawl. It was fun! A beautiful and elegant tablescape! Very sophisticated with clean lines! I have saved this post.. there are so many wonderful tips in here.. where is your book? I love the table.. simple but soo very effective. The bit about splitting the height to the ceiling was such an eye opener. Exquisitely feminine! Hey, Marlis! Thanks!!! That really makes me smile! 🙂 It was fun to get out in a different setting other than my dining room. I’ve been cooped up all these months, and I was getting a bit stir crazy! I thought I’d be able to go out on my deck and enjoy lunch today since it is nearly 70 degrees, but the wind would blow me into the next county!!! I don’t know how the poor folks in the St. Patrick’s Day parade are coping with this wind!!! Anyhoooooo…thanks for stopping by, and I really hope you have a great weekend. Hallelujah its just about 29 hours away!!! Take care! Beautiful Table – so elegant, you are quite creative! Thanks for sharing! Wow, what an elegant table, Alycia. Thank you so much, Marigene! It gave me some ideas for a backyard party I will be doing later in the spring….if we are ever able to reclaim our backyard after all this rain and snow!!!! So sleek and chic and yet so feminine, too. 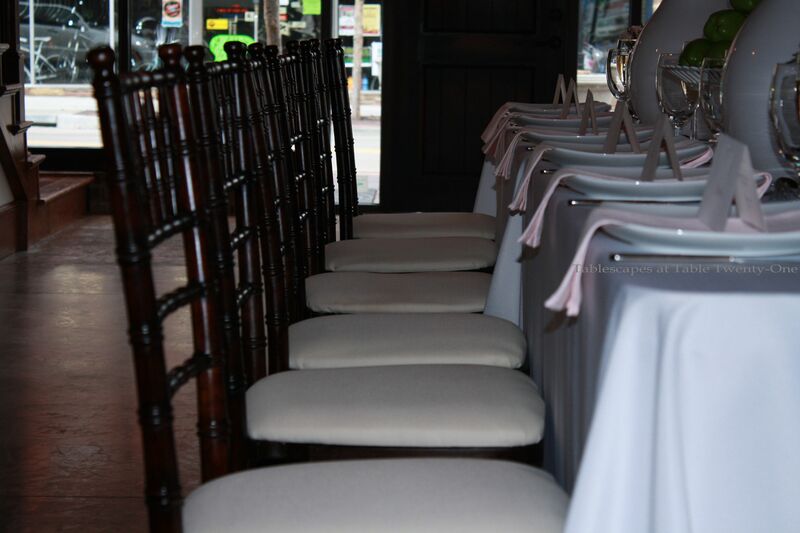 A perfect setting to celebrate such a special occasion! 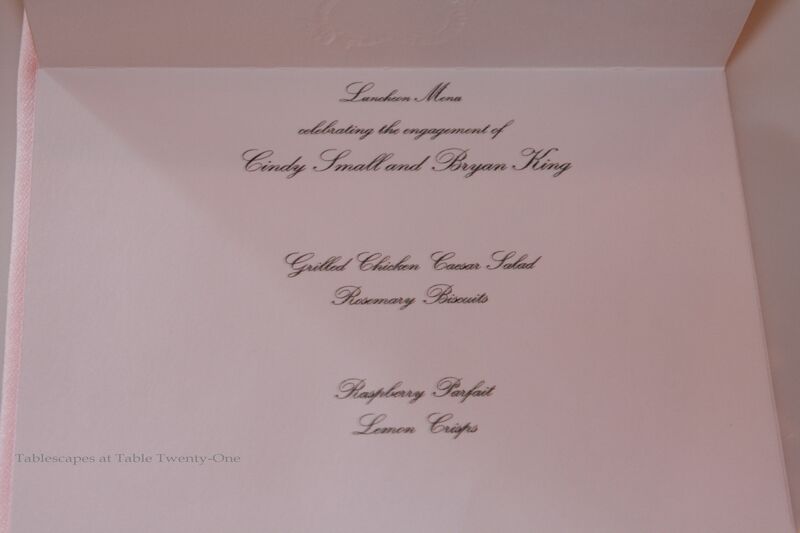 LOVE the menu…you are too funny! I had the honor of seeing this one in person and it was ANOTHER wonderful setting that was so elegant. 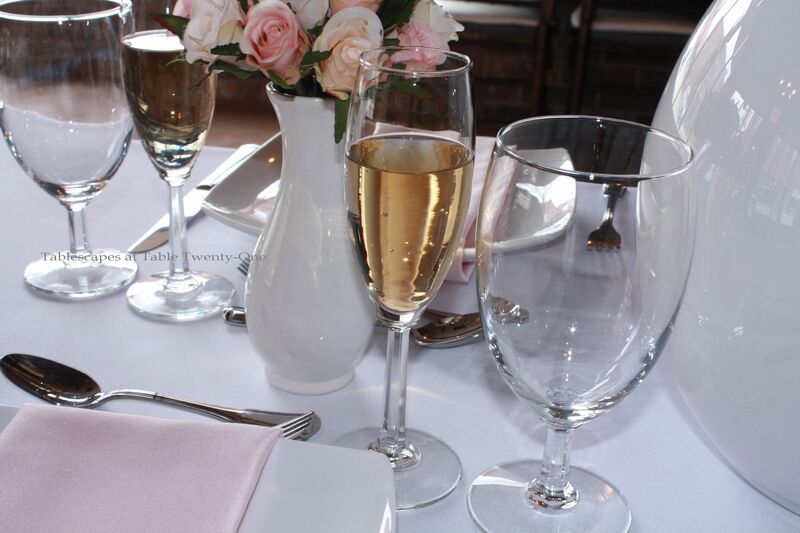 PERFECT for a blushing bride……you always give wonderful ideas! Let me know when you want to return and set up another wonderful tablescape upstairs this time! Ha! Cindy, the menu is what Sheri and I were giggling about! I wanted it to be a surprise for you! 🙂 Thanks again for letting us invade your space. We had a good time, and I can’t think of a cooler space to set up in. No wonder you stay so busy!!! I would be thrilled to be able to come back to do another one upstairs in the loft area. That will be super slick!!! Thanks again!!! Very elegant and beautiful table, fit for a beautiful bride. I love fruit with flowers, the whole thing is like a sweet simphony of spring. You’re so sweet, Fabby! Thank you! What a fantastic setting. Simple but elegant with all your small details. Hope your in the best of everything. Absolutely stunning! She must be thrilled with this. You always do such a good job, lady. Great work! I will be returning to this post time and time again. Great information, I just love the way everything lines up so perfectly. 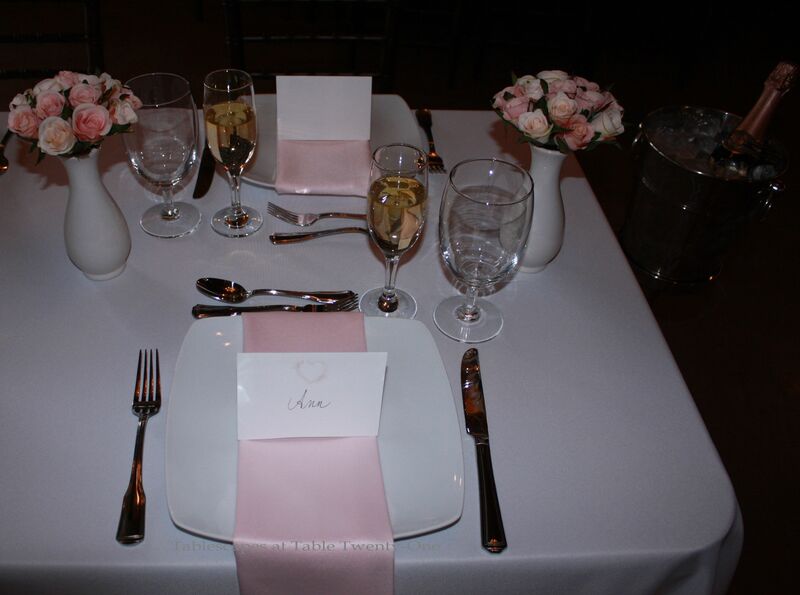 The table decor is just so elegant and yet it doesn’t appear cluttered or over-decorated, if you know what I mean. I think the placecards combined with the menu is an excellent idea. 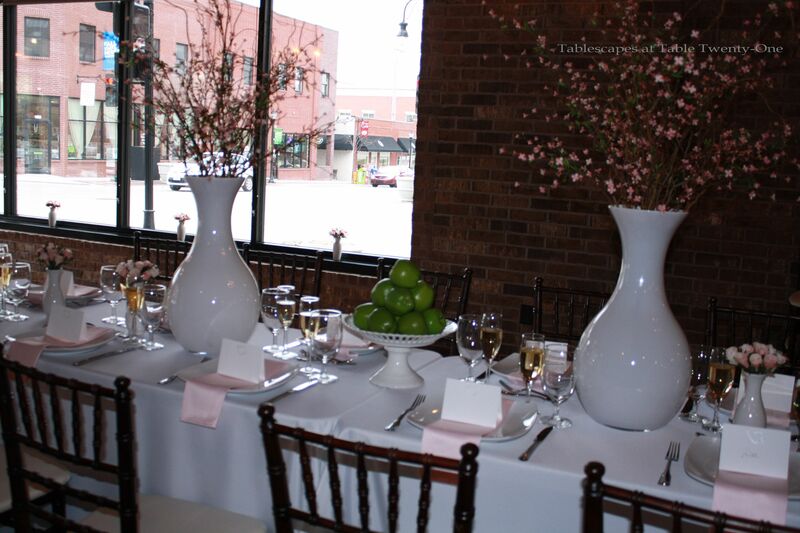 Would you leave those tall vases on the table when everyone starts to eat or would they be taken off? I noticed that they were placed sort of in between, and since there are no seats at the end, they probably wouldn’t be a distraction. The little vases of roses are adorable, and I do love decorating with fruit. Thanks so much for sharing your expertise and your creative talents!! Hi! Hooray! I’m glad you like it! I just heard from the Maid of Honor this afternoon, and she was extremely happy. Whew! That takes a load off!!! When I don’t hear back from people right away, I get really nervous! She asked if I’d be offended if they pretty much copied it to the letter. Heck no! Go for it, but just be sure everything reflects the bride’s affinities!!! Anyhoooo…you asked if the taller vases would be removed. Never! That’s something I always test: sit down and look across the table to see what guests would see. If the vases are strategically placed in the dead zone, you’re good to go! As I recall, you come from a big family, right? This type of arrangement would be perfect for you guys when you all get together! If you have any fears about a sight line being obstructed, use clear vases instead of opaque ones. 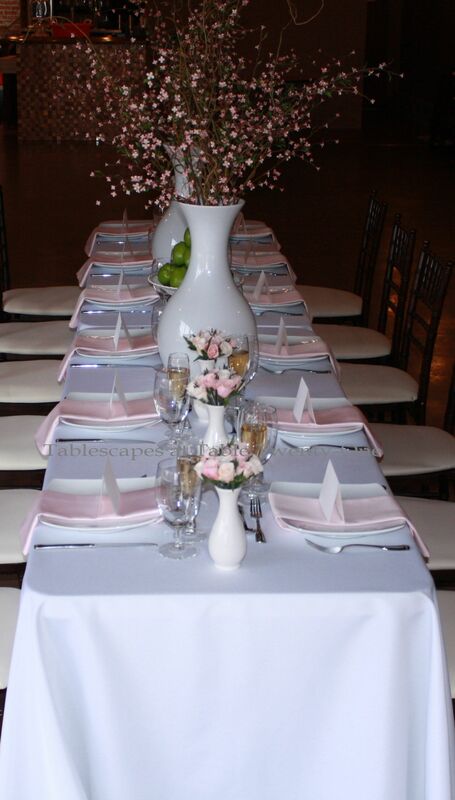 If you have a table that is wider than the standard 30″ that most banquet tables run, you can also double up your little vases so they run two-by-two instead of singularly as shown here. That REALLY gives the table some pizazz! Or, if you want to leave a little space for bread baskets or something like that, remove one of the tiny vases. Hope that helps! Again, so glad you like it!!! Thank you for stopping in. I ALWAYS love hearing from you! Have a really good weekend!!! The elegant simplicity of the tablescape is what makes it so stunning. Just another example of your ingenuity! Nice setup. Pink is usually a motif that suits everyone, even the most finicky of guests. I like the tabletopper too, it sets an elegant atmosphere.